There was a time in my wine drinking life that I only consumed white wines predominantly Riesling and Sauvignon Blanc, thank goodness those days are gone. I now happily consume all wine, actually any wine I can get my hands on. Pinot Noir however has won a place in my heart over the years. I sometimes find myself craving a bottle of Pinot Noir from Oregon like a dieter who has sworn of chocolate but still needs their daily fix. Today however I found myself holding none other than a Burgundy Pinot Noir and I couldn’t have been happier. Philippe Colin has mastered the tricky balance of creating a Pinot Noir that embraces the classic French terroir driven style, with the grapes natural ability to leave a palate roundly and smoothly satisfied. 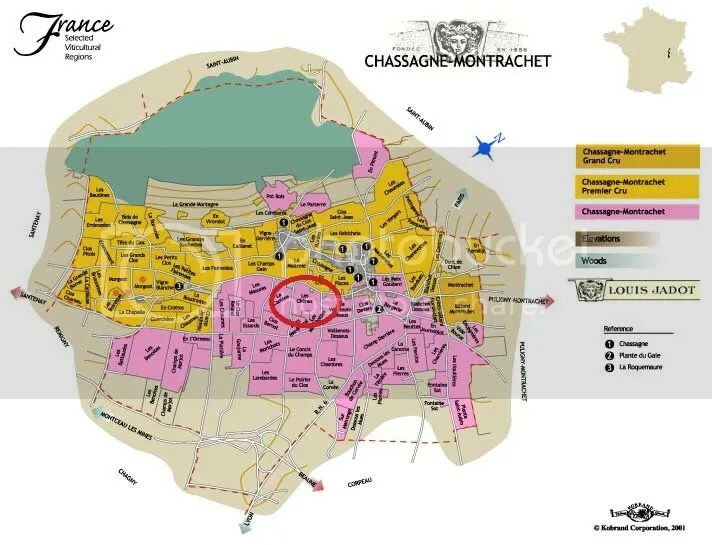 The French village Chassagne-Montrachet dates back to an old Gallo-Roman town in 886 then known by Cassania, the Gallic term meaning place of oak; later adopted by the French as Chassagne. The village of Chassagne endured many hard times of war, between the Dutch and Burgundy Kingdom of France. It was also burned to the ground in 1476 by the troops of Louis XI after his lord sided with the cause of Mary of Burgundy, heiress of Charles the Bold. Life was later breathed back into the land during the revolution in 1791 with the creation of the cadastre and the renovation of its vineyards. The name Montrachet dates back to 1252 when monks were using it to name the characteristics of the land their abbey sat on “a peeled mount bald rock” where they were growing boxwood and other thorny bushes. The village was known as Chassagne-le-Haut until 1879 when a French decree renamed the land Chassagne-Montrachet (Pronounced Morachet). 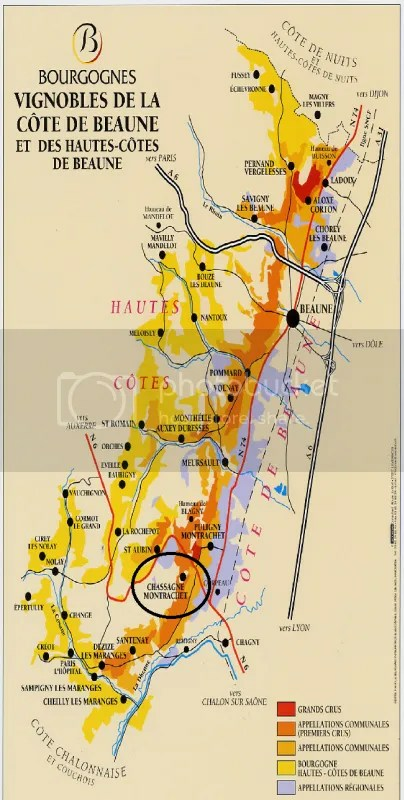 Les Chenes is a small sub appellation in the Chassagne-Montrachet village in the Cote De Beaune half of the Cote D’Or region of Burgundy, France, did you get all that? It’s perfectly fine if you didn’t, as French wines can come off very confusing to the untrained eye. A French wine label is riddled with so many names it almost makes a reader dizzy, so its helpful to break it down a bit. The village appellation of Les Chenes is shared between two wine makers Domaine Philippe Colin and Domaine Roux Pere et Fils. It is important to note that the wines being grown on this section of land are not premier or grand cru wines but of the village level. Chanssagne-Montrachet only has three grand cru appellations Le Montrachet, Batard-Montrachet and Les Criots Batard Montrachet. Domaine Philippe Coli n was founded in 2004. It now operates roughly 28 acres of vineyards all around the village of Chassagne-Montrachet. Philippe’s white and red wines are available in 28 different appellations, some done in very limited quantities allowing the consumer to discover the diversity and richness of the land, (or as the French would call it the “terroir”). Philippe’s wine making philosophy focuses around soil tillage and pest control. His wines are aged in oak barrels for 12 to 15 months and are bottled after a light filtration. Philippe’s 09 Red Burgundy is a great all around wine. The nose opens up like a tour d’ France of classic old world and Burgundy notes. Terroir is of course ever-present in the nose, notes of bark, dry leaves, dark fruits and a very light almost transparent hint of spice. On the palate this Pinot Noir comes at you slightly different like a young mademoiselle who may have just changed from her everyday work attire to that of a women on the prowl. This wine drinks with an extremely round palate and finish. Soft notes of dark cherry, and light oak mingle with the round acidity and ever so light touch of tannin as it washes across your palate. Lighter cream sauces, chicken, or even red fish like tuna and salmon would pair well with this wonderful Pinot. Cheese wise id probably go goat but I’m a bit biased on that one . My pleasure glad you enjoyed it and found it helpful.